The populous Kingdom of Morocco is the most westerly country in North Africa, one of only three countries in the world to have both Atlantic and Mediterranean coastlines – the others are Spain and France. A vast region featuring a variety of landscapes and micro-climates, from the temperate Rij mountains to the tropical Sahara Desert, it supports a rich diversity of wildlife, including five families of snakes; Boidae, Colubridae, Elapidae, Leptotyphlopidae and Viperidae, comprising 27 different species. Ranging throughout the deserts of North Africa, the desert horned viper (Cerastes cerastesis) of the Viperidae family is most commonly seen in the Sahara Desert between Egypt and Morocco. Found in a variety of habitats within the desert, including rock hills, sandy desert and valleys, the viper partially submerges itself in sand dunes to escape the scorching sun. A relatively small snake in comparison to most desert snakes, adult desert horned vipers reach from 1 to 2 feet in length. With brownish-yellow colors blending seamlessly into the desert floor, its most distinctive feature is a pair of supra-orbital “horns” that consist of a single scale above each eye from which dark lines extend down its back. The desert horned viper produces a mild venom to kill its prey that includes geckos, birds, small rodents and a variety of lizards. One of the most common and widespread venomous snakes in Africa, the puff adder (Bitis arietans), also a viper, ranges throughout North Africa. It is considered one of the most dangerous snakes on the continent, responsible for 60 percent of all recorded snakebites. Sluggish and mainly terrestrial, the adder, like most snakes, is reluctant to bite unless provoked. Bites are usually the result of people inadvertently stepping on the dull-colored snake. Its venom destroys tissues (cytotoxic), and is injected by front-hinged fangs that fold outwards in an action similar to a switchblade when the mouth opens, and fold back up into a protective sheath when the mouth closes. If not treated, death may occur in 26 hours, or may result in deep necrosis requiring amputation of the affected body part. The puff adder prefers open grassland, savanna, open woodlands and rocky outcrops. Most adults are just over 3 feet long with thick bodies covered in chevron-shaped dorsal scales in yellow, dull orange, brown and beige. They primarily feed on rodents and birds. The Egyptian cobra (Naja haje), also known as an asp, lives in open fields, countryside and cultivated farmlands throughout the hot, arid regions of Morocco. It is usually found near water and is often observed around homes searching for rodents. When aroused, this member of the venomous Elapidae family rears up about 2 feet, flaring its neck ribs to form a broad hood up to 5 inches wide. It has fixed front fangs that inject a potent neurotoxic venom. Paralysis sets in and death follows due to respiratory failure, if not promptly treated. 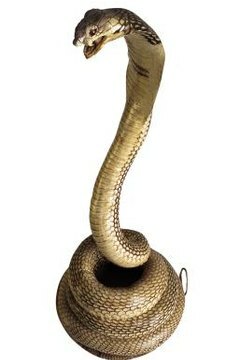 Adult Egyptian cobras may grow up to 7.5 feet long, with broad black bands encircling a yellow or grayish-brown to dark brown body, with a black or brown head. Its diet primarily consists of toads, frogs, birds, bird eggs, lizards, snakes and small mammals. Representing imperial power in ancient times, the Egyptian cobra was depicted on pharaoh’s crowns. It is widely thought to be the “asp” chosen by Cleopatra to kill herself. The javelin sand boa (eryx jaculus) of the Boidae family is a constrictor that coils around its prey causing suffocation. They range throughout North Africa from Morocco to Egypt. Nearly 3 feet long, this boa’s thick, sandy brown to yellow or reddish-brown body blends seamlessly into the sand of the desert. Like all members of Boidae, they are ambush-style hunters, hiding in the dunes to surprise their prey of small mammals, lizards, birds and slugs. A small, harmless snake about 3 feet long, the common African house snake (lamprophis fuliginosus) of the Colubridae family feeds on mice and is found everywhere in Africa, except the desert. Commonly found in and around homes, thus its name, the house snake is a placid, primarily nocturnal snake. Its color ranges from dark to light brown with two distinctive stripes on either side of its head. The beaked thread snake (Myriopholis algeriensis) of the Leptotyphlopidae family is distributed throughout North and South Africa. They are small, slender snakes with shiny, brown scales, and are adapted to burrowing (fossorial). They primarily feed on ant and termite larvae, pupae and adults; producing pheromones to protect them from attacks by termites.